Almond Biscuit Base, Cherry & Almond Bakewell Cheesecake Filling, Whipped Cream, Fresh Cherries, and even more Almond! I recently did a post on my Facebook to request any recipes that you guys were craving! One of the main ones? A Bakewell themed bake! I of course, took this with a roll, and made a non-bake treat… slightly ironic, but I’m sure you will love it. 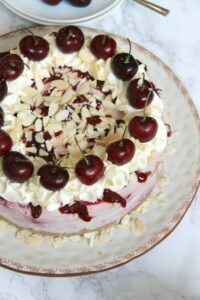 I have a post on my blog for a Bakewell Tart but its quite old now, so the pictures are a little poor. 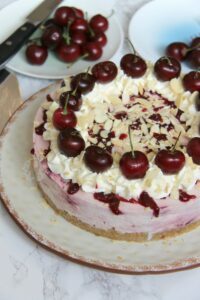 I wanted to make something new and DELICIOUS, so of course I made it Cheesecake themed! I made the base slightly differently by adding flaked almonds to the base. You can use ground almonds, but you can’t decorate very well with ground almonds, so I used flaked almonds for both. 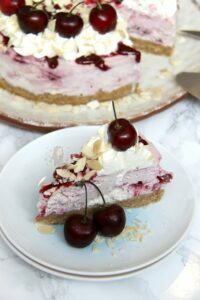 I decided to use Cherry Jam/Conserve for the filling as I wanted to have something in the cheesecake to give it a bit of flavour. 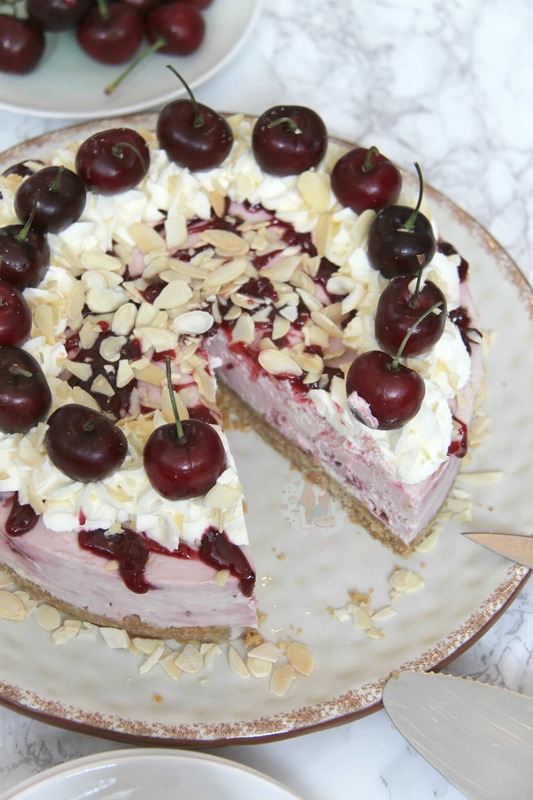 I didn’t want to have just a plain almond cheesecake as for me its a little boring, so I thought adding in a fruity flavour like raspberry or cherry was best! I used Cherry Conserve as I wanted something thick and gloopy essentially so that it would help the cheesecake set, not make it runnier. I relatively recently posted my Cherry Bakewell Cupcakes which were a hit, and I know you bakewell lovers will love these as well. 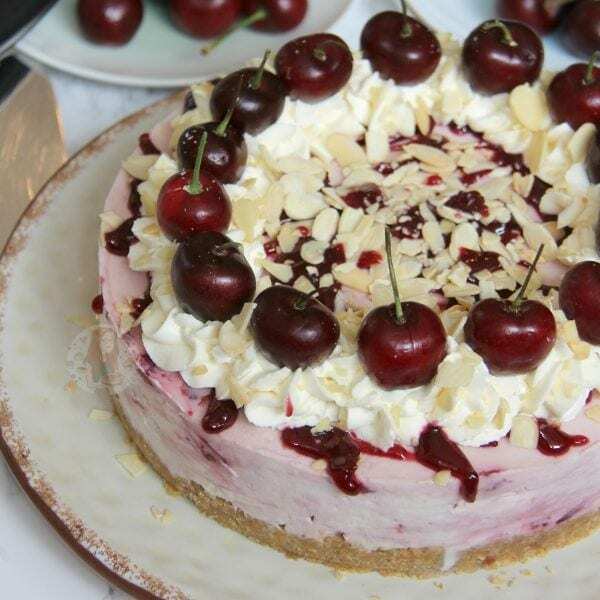 Like my Cherry Bakewell Cupcakes, you can use Glacé Cherries for the decoration if you wanted instead of fresh ones, but I love a fresh cherry! You can only ‘drizzle jam’ so much, mine is more blobs that anything but it gives it a decoration element. Blitz the biscuits with the flaked almonds in a food processor to a fine crumb. Melt the butter in a pan or in the microwave, and then add the melted butter to the biscuits and almond mix. Pulse a few times until it is combined well. Tip into a 8″/20cm Deep Springform Tin and press down firmly – chill in the refrigerator whilst you do the rest! With an electric mixer (I used my KitchenAid) Mix the Cream Cheese, Vanilla Extract, Almond Extract and Icing Sugar together until smooth, it’ll only take a few seconds. Once its thick, loosen the jam slightly in another bowl. Carefully fold through the jam into the cheesecake mixture only a couple of times so its swirled, and not completely mixed through. Spread the mixture onto the biscuit base and spread evenly. Leave to set in the fridge, covered, for 5-6 hours, or preferably over night. 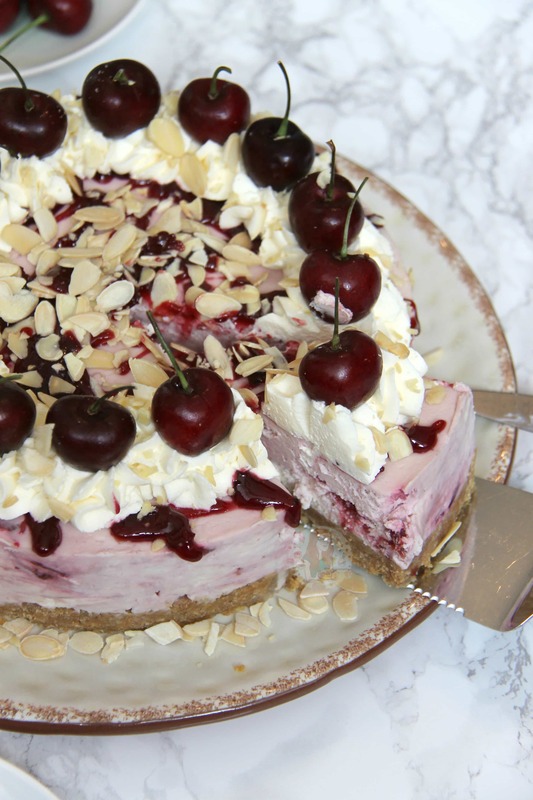 Loosen some more jam and drizzle it over the cheesecake. Whip together the Double Cream and Icing sugar until thick and pipe onto the cheesecake with a 2D Closed Star Piping Tip and then sprinkle on some toasted flaked almonds. 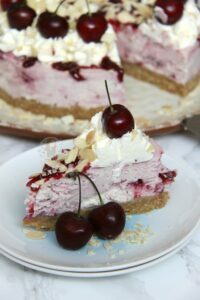 Add some cherries to the little cream swirls, and enjoy! I just used some nice Cherry Conserve from Tesco, but you can use any that you like. You can also just fold through some fresh cherries instead if you wished, but you should really de-stone them. This delicious treat will last in the fridge, covered, for 3 days! You don’t have to use the almonds in the base, or the extract in the filling, but almond is what bakewell is! You can’t have bakewell without almond! Older Next post: Malteser Fudge! Newer Previous post: Black Forest Brownies! 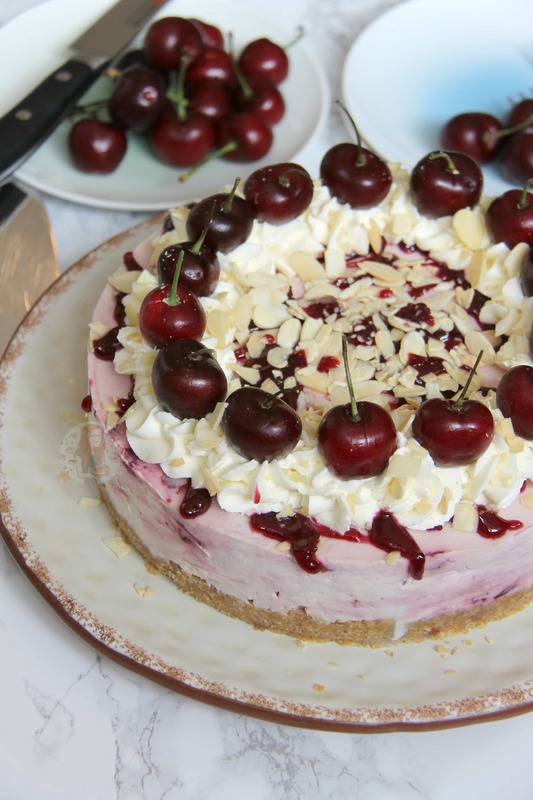 This cheesecake is absolutely delicious. I’ve made it twice already in less than two weeks!! The first one – I took most of it to work to share with friends and it went down really well! I want to try the lemon drizzle cheesecake next! Oh and the crunchie one!! Use either – it honestly doesn’t matter. Any either between there is fine. Some brands vary in weight hence the weight range. I assume that any jam would work in this cheesecake – I don’t really like cherries much but love raspberry jam! Thanks for any help – your recipes are amazing and I use them all the time! Have just made this. Super excited to try it. Love love bakewell tart.